Udit and I met at university in UK back in 2006. 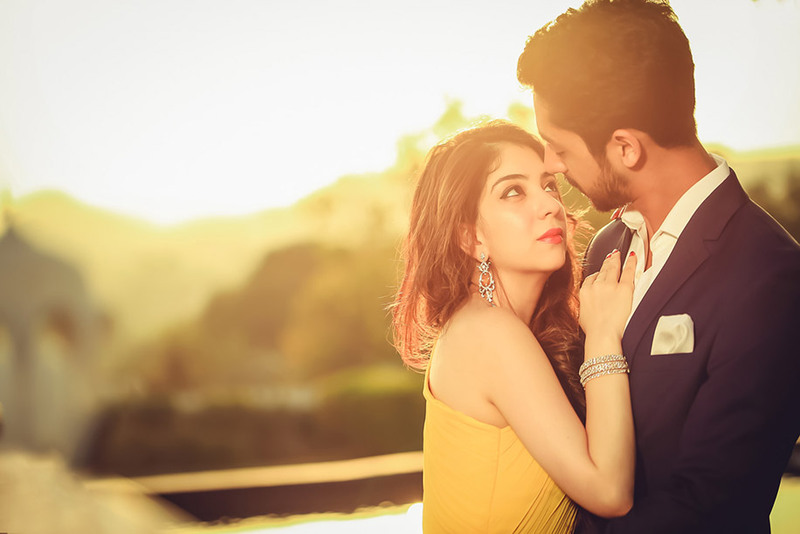 It was quite a stereotypical situation – ‘Party Girl’ meets ‘Geek Boy!’ Udit was – and still is – quite organized, punctual and extremely hard working. I, on the other hand, am very messy, extremely spontaneous and always late. I asked Udit to help me with an online exam and that’s how it all began. 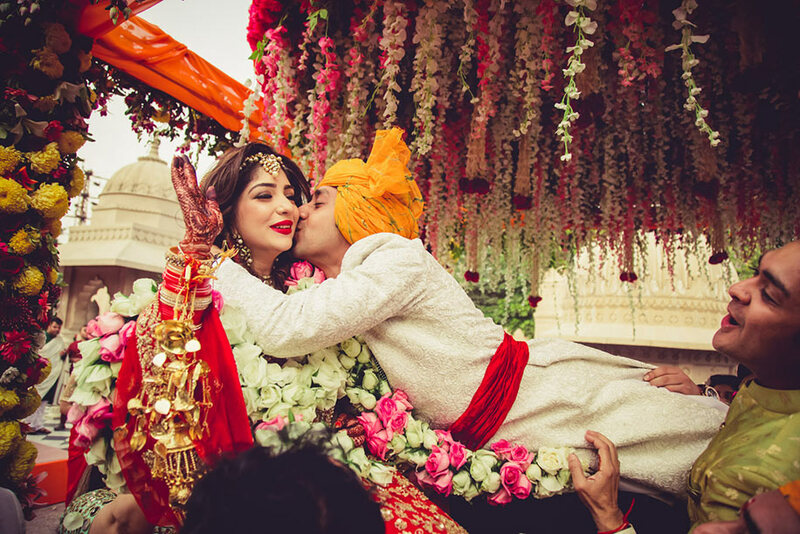 We have been together for nine years, and have celebrated every milestone together along with supporting each other through every hurdle – and that’s what makes one a great companion! 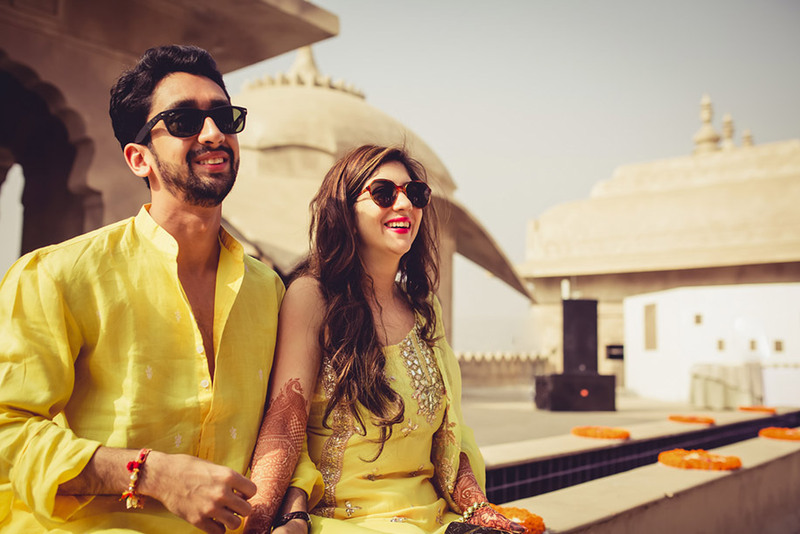 Udit and I are opposites in many ways and we often get asked – and also ask each other – how we have made it this far! The honest truth is that sometimes you love the person for all the reasons they are not like you and because they inspire you to be a better version of yourself. Many locations were considered when we were shortlisting places – so choosing a location that worked for all was a mission! I was born in Mumbai, grew up in Dubai and now live in London. Udit was born and brought up in New Delhi and now lives in London. 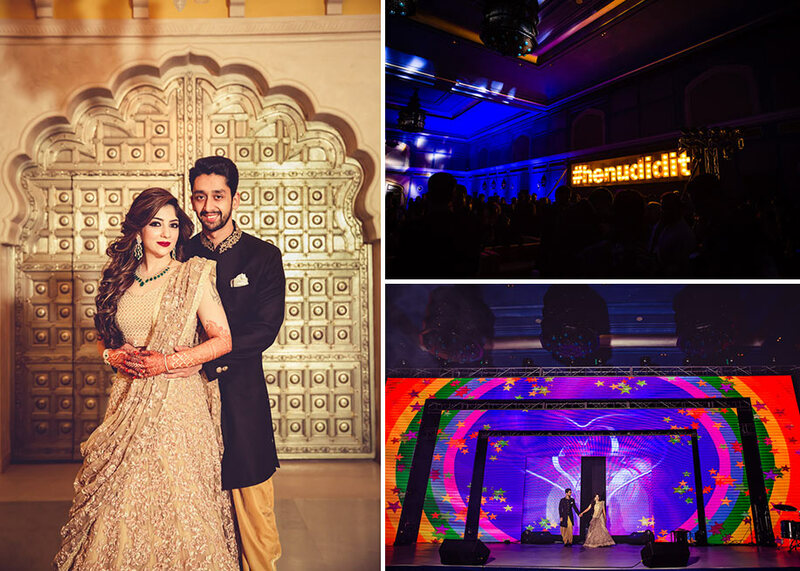 I always wanted something opulent, intimate and out of the ordinary for my #henudidit wedding. 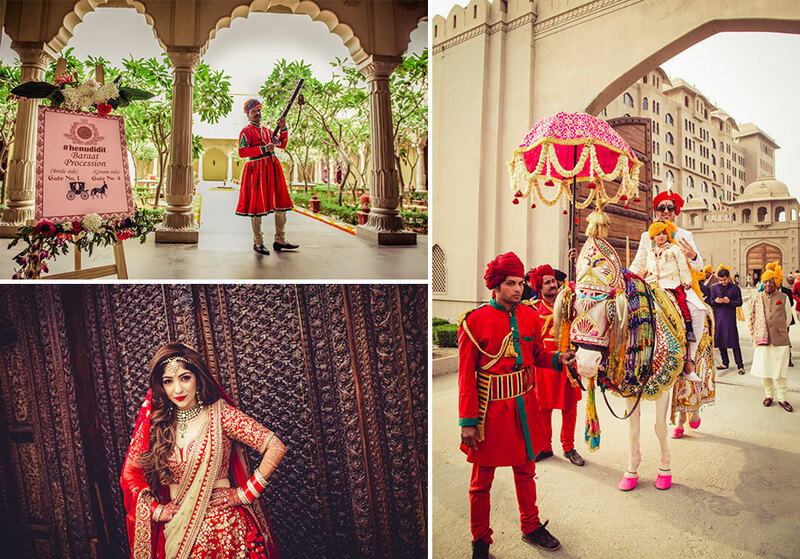 We looked at Udaipur and Jaipur as destinations as we wanted a palace wedding. 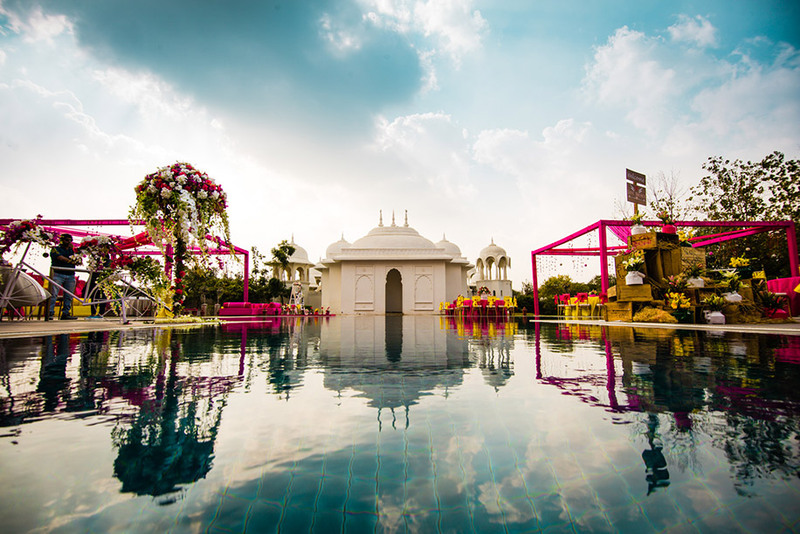 I didn’t want any logistical stress while planning the wedding so Udaipur was quickly ruled out. 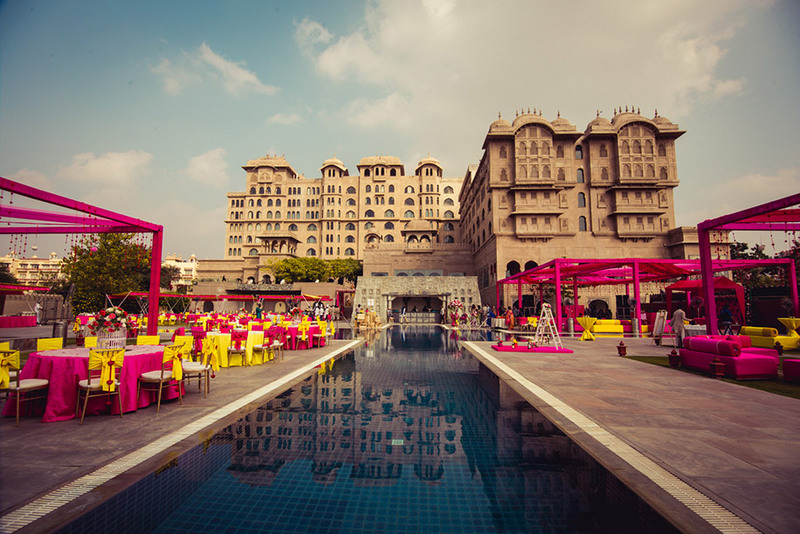 Fairmont Jaipur was an ideal fit for us as it had the grandeur and elegance we were looking for. We personalized our entire wedding with unique stationery. Our logo was on the cars that were sent to receive guests, on welcome and thank you letters, baggage tags and signage boards. We even had door hangers stating ‘Do Not Disturb – We have partied with Udit and Henna’ for the hotel replacing the boring DND signs. 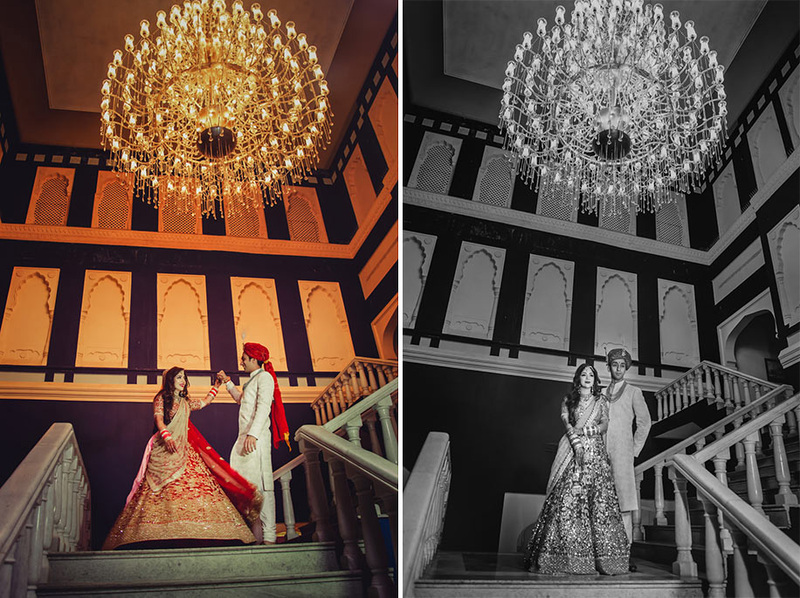 My amazing photographers from Hitched & Clicked recommended that I avoid prints for this photoshoot as they were distracting and opt for block colors instead which would complement the palace architecture better. 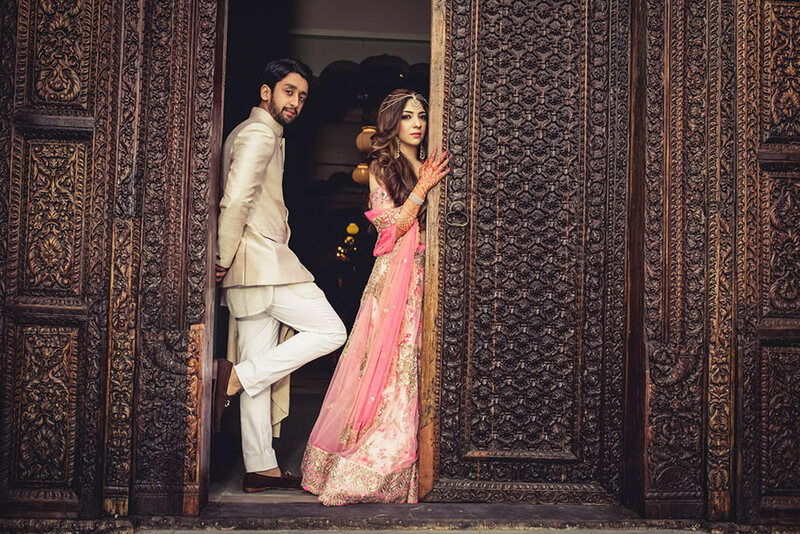 I opted for a Nikhil Thampi off-shoulder lehenga in blush pink and gold – this was a one-of-a- kind lehenga wherein the blouse sleeve continued on and acted as a dupatta. I also wore a white Mahima Mahajan cape outfit and a green gown by Shantanu and Nikhil for a younger and more international look. 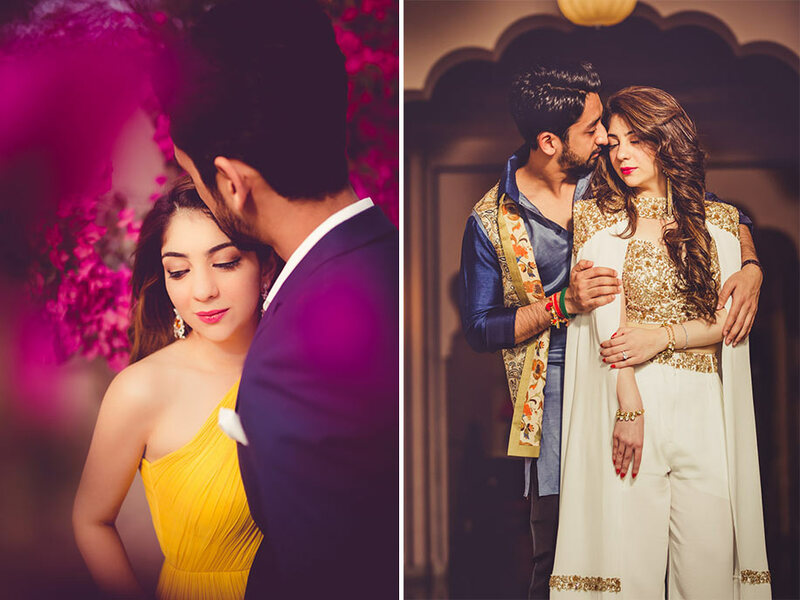 The function I was looking forward to the most was the ‘Love Brunch Mehendi’ which was a fusion of a traditional henna ceremony with the more flamboyant brunch scenes that I enjoyed in London. 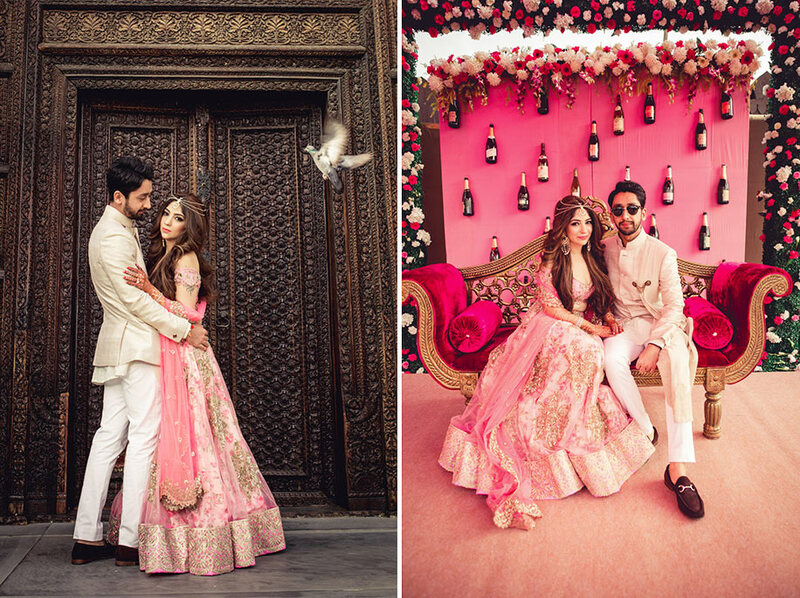 I wanted all the things I loved in this function – so I picked pink as the color theme, the drink of the evening was champagne, the dance floor had hearts over it and a talented violinist played all my favorite tracks. Our photo booth for the occasion was a champagne wall which had the real bottles of all my favorite champagnes. 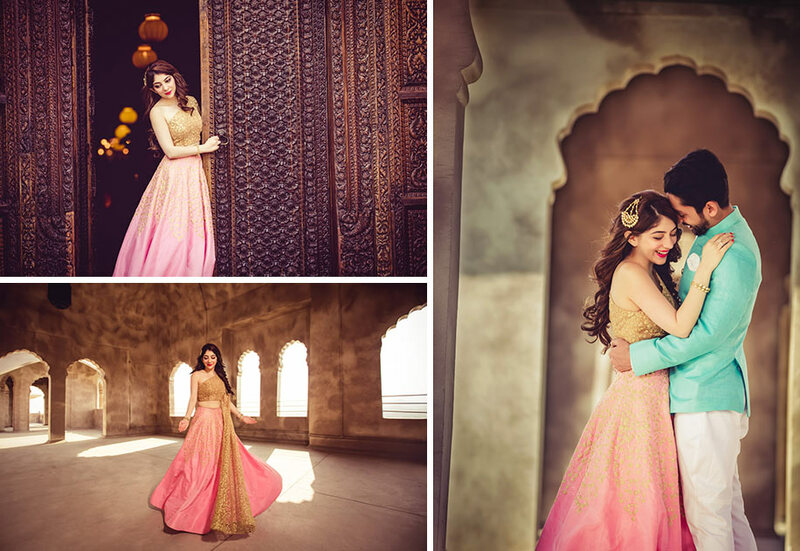 For this occasion, I wore a pink Anushree Reddy floral print lehenga with an off-shoulder blouse. I personalized my look with a handmade Moroccan head chain which made my look very different from traditional brides who usually wear floral jewelry. 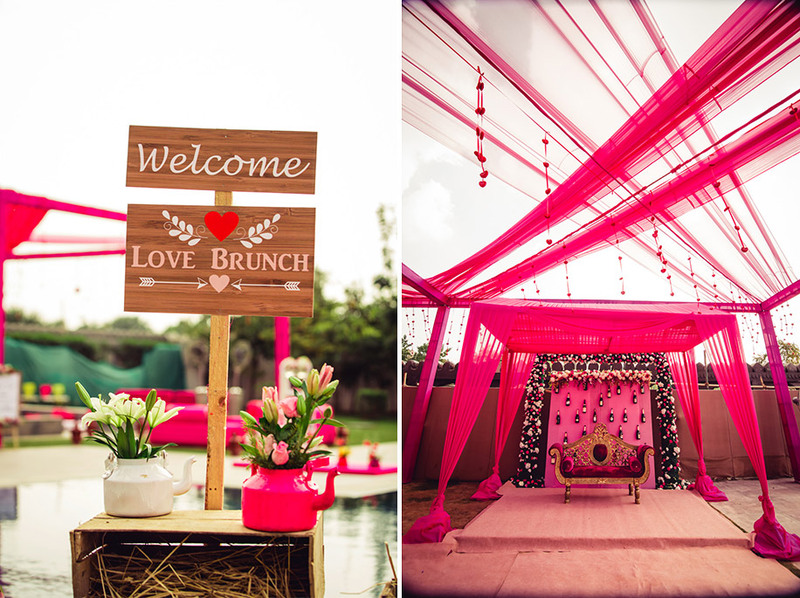 The entrance for our sangeet had an LED split screen – this really set the scene for the function. We had Sumit Sethi and his band play until the wee hours of the night. 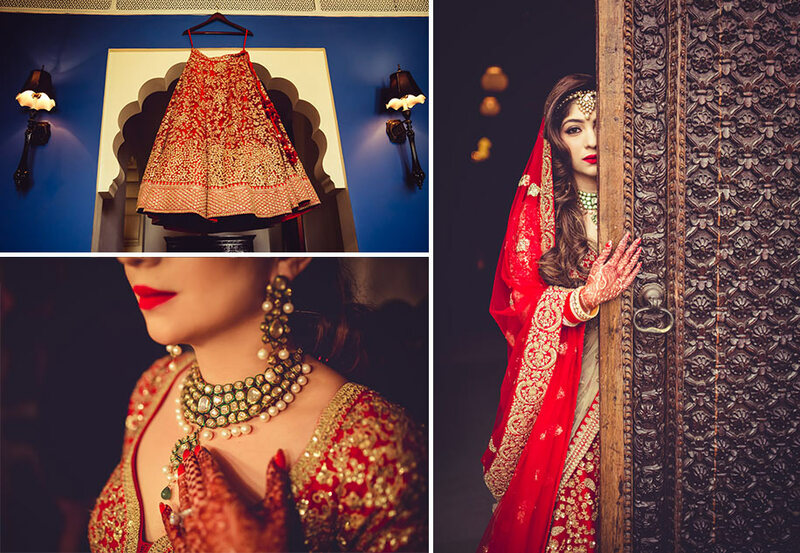 I wore a gorgeous ivory Shyamal and Bhumika lehenga with zardozi work and paired it with an emerald set to provide some color and contrast to the heavily embroidered outfit. I wanted to wear different looks for each of my functions, and my makeup artist Ojas Rajani recommended donning ‘Berry Lips’ for this look which I was extremely pleased about. We picked a long bar for this occasion and personalized it with the backdrop of our #henudidit in tube lights – this was something that had never been done before. I have always wanted afternoon pheras since I was a little girl. There is something about the way the sunlight hits the domes and brings out the color in fresh flowers that I have always adored. 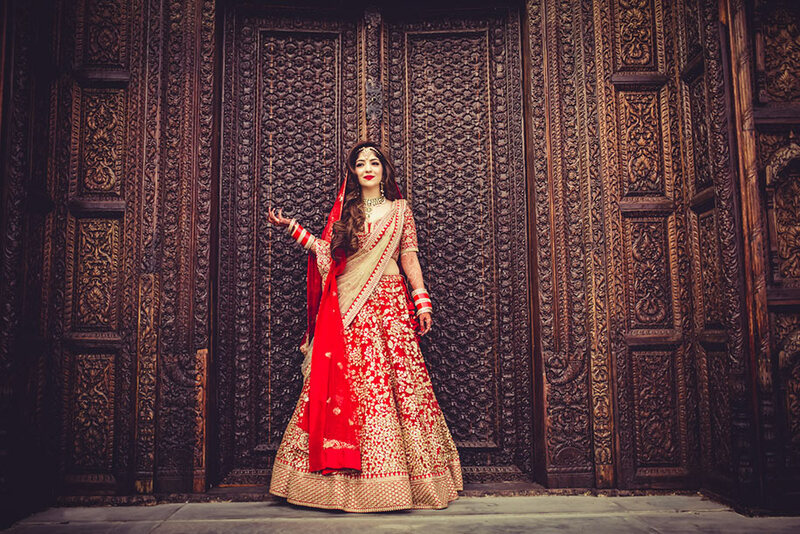 For this special occasion, I picked a quintessential red lehenga by Sabyasachi as it perfectly fitted the occasion and complimented my skin tone. 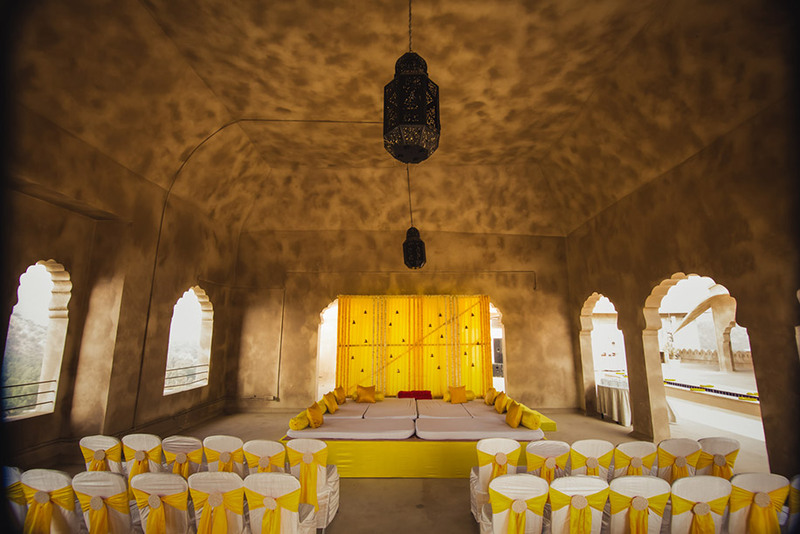 I only wanted fresh flowers in my mandap and my planners created an entire dome mandap only from flowers. We also brought in ‘Bal Pandits’ from Haridwar to bless us and chant the Gayatri Mantra. 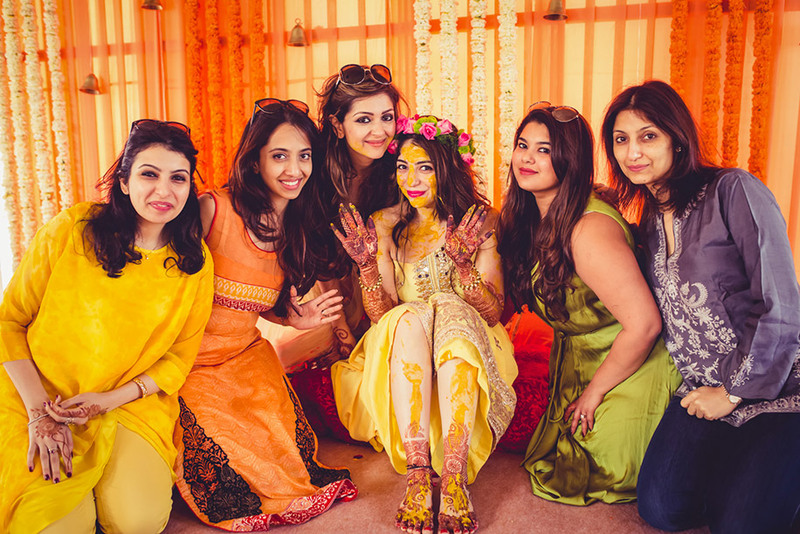 The standout element in my pheras was my ‘Girls Baraat’. While attending my friends’ weddings, I always wondered why the bride had to wait in boredom in the hotel room while the groom enjoyed his glory moment. Why should guys have all the fun? 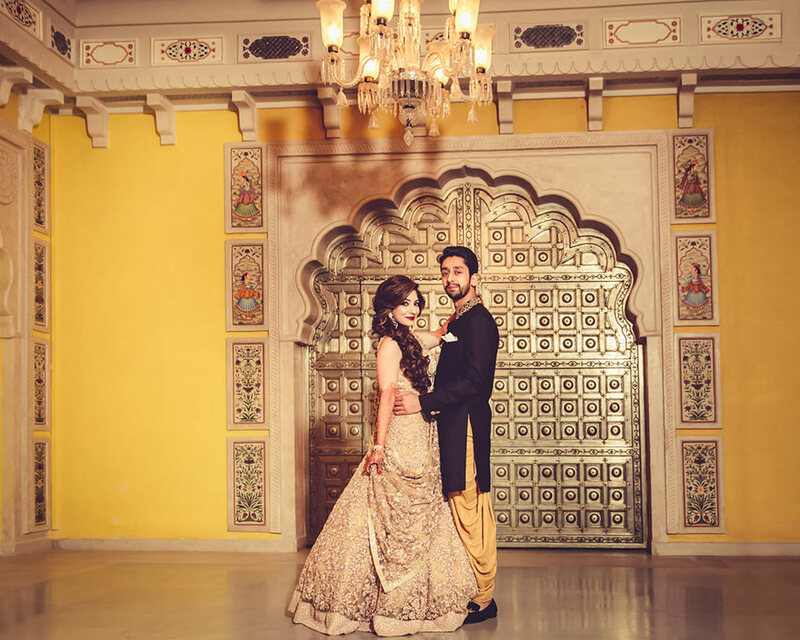 I wanted to reinvent the wheel and change the rules, so my dad and I decided that – as a surprise – we would have a ‘Girls Baraat’. I made my entry in a carriage, dancing to the popular hit ‘Kala Chashma!’ played by a DJ on wheels. 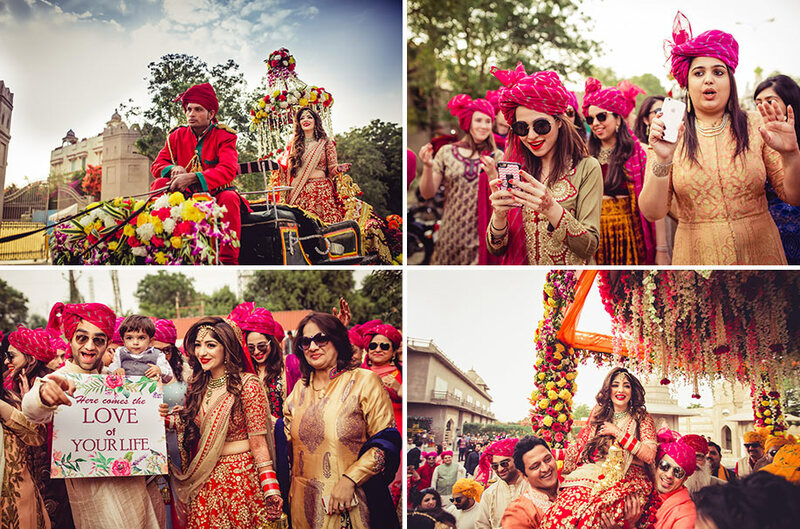 All my friends danced in my baraat and had pink ‘safas’ (turbans) tied on their heads. 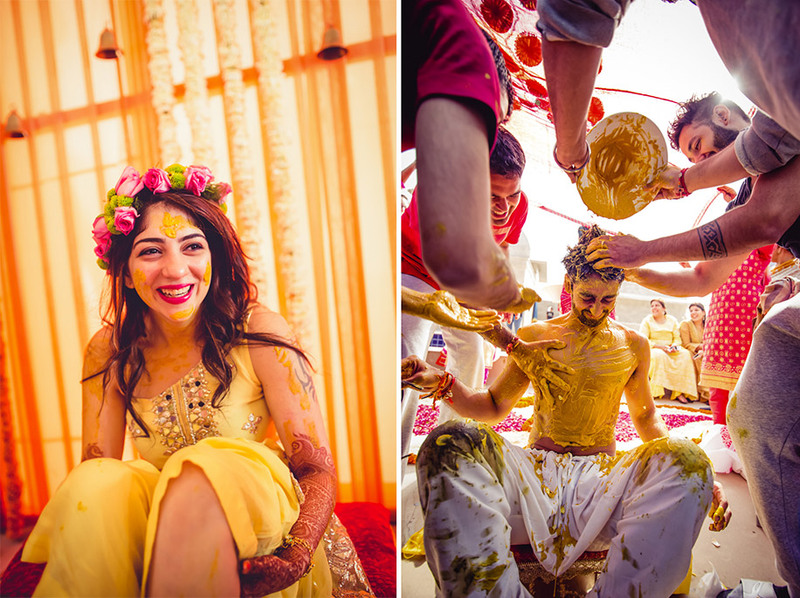 This time around, the bride made the groom wait. 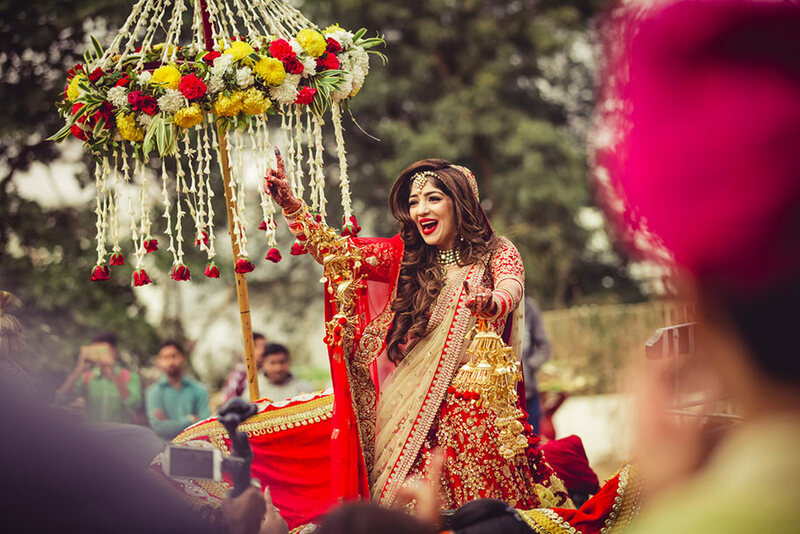 Everyone at my wedding came up to me later and said that even they would include a ‘Girls Baraat’ at their daughters’ weddings. 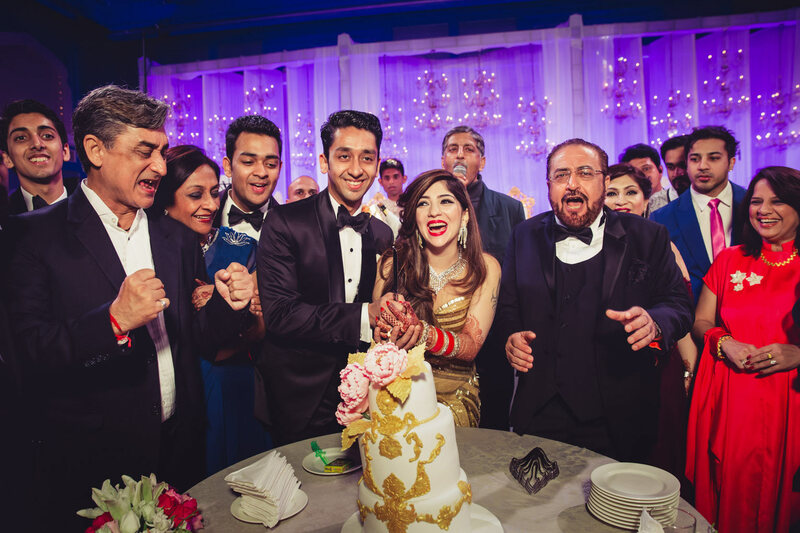 My walk to the mandap remained traditional but had a twist… I entered with my brothers under a floral ‘chattar’ (canopy) but walked to the Coke Studio version of the beautiful ballad ‘Afreen Afreen’ by Nusrat Fateh Ali Khan as that is one of Udit’s favorite songs. This was a surprise for him and our guests! We termed this as a ‘Happily Ever After Party’. 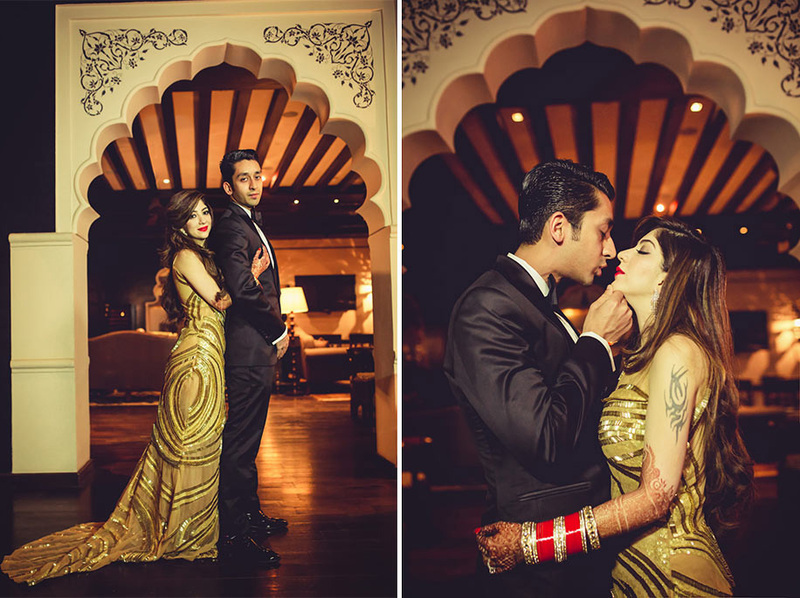 Our wedding card stated: “We have waited nine years to party with you, so please party accordingly.” I wore a gold embellished Monisha Jaisingh gown with a long trail. 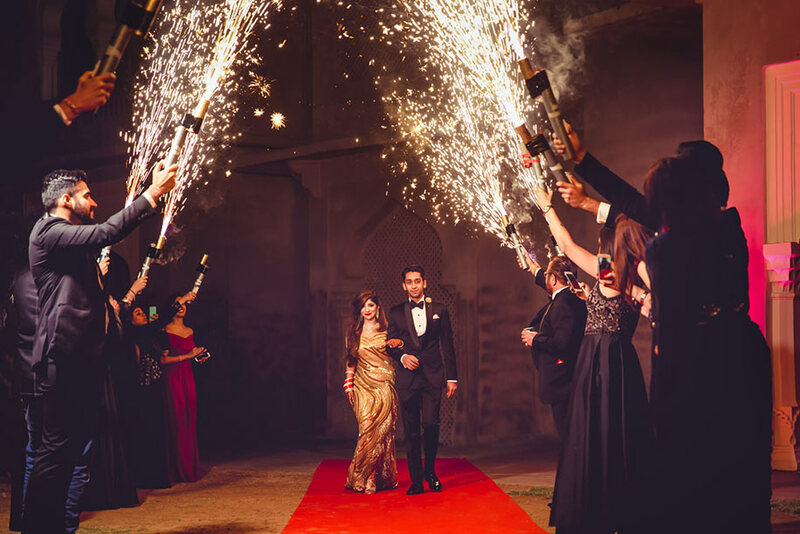 Our entrance was with cold pyros in the backdrop of the entire Fairmont – that was my fairytale moment, especially given my outfit – what’s a fairy tale without a trail?! We had international violinists and percussionists entertaining us all that night. Our dance floor had our logo, and our photo booth that night was a collage with our proposal and engagement pictures from Florence, Italy. Our party went on till 7am, after which guests went directly for breakfast!